Despite two linear algebra classes, my knowledge consisted of “Matrices, determinants, eigen something something”. Linear algebra gives you mini-spreadsheets for your math equations. We can take a table of data (a matrix) and create updated tables from the original. It’s the power of a spreadsheet written as an equation. 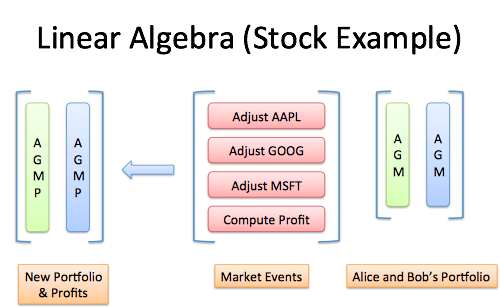 Here’s the linear algebra introduction I wish I had, with a real-world stock market example. “Algebra” means, roughly, “relationships”. Grade-school algebra explores the relationship between unknown numbers. Without knowing x and y, we can still work out that $(x + y)^2 = x^2 + 2xy + y^2$. “Linear Algebra” means, roughly, “line-like relationships”. Let’s clarify a bit. Straight lines are predictable. Imagine a rooftop: move forward 3 horizontal feet (relative to the ground) and you might rise 1 foot in elevation (The slope! Rise/run = 1/3). Move forward 6 feet, and you’d expect a rise of 2 feet. Contrast this with climbing a dome: each horizontal foot forward raises you a different amount. An operation is a calculation based on some inputs. Which operations are linear and predictable? Multiplication, it seems. Exponents ($F(x) = x^2$) aren’t predictable: $10^2$ is 100, but $20^2$ is 400. We doubled the input but quadrupled the output. So, what types of functions are actually linear? Plain-old scaling by a constant, or functions that look like: $F(x) = ax$. In our roof example, $a = 1/3$. If we allowed non-linear operations (like $x^2$) we couldn’t split our work: $(a+b)^2 \neq a^2 + b^2$. Limiting ourselves to linear operations has its advantages. No! Grammar is not the focus. What’s the key idea? Not bad. We could write it (x, y, z) too — hang onto that thought. We could abbreviate the entire function as (3, 4, 5). We know to multiply the first input by the first value, the second input by the second value, etc., and add the result. Only need the first input? Neat. We’re getting organized: inputs in vertical columns, operations in horizontal rows. As an input passes an operation, it creates an output item. In our example, the input (a, b, c) goes against operation F and outputs 3a + 4b + 5c. It goes against operation G and outputs 3a + 0 + 0. A matrix is a single variable representing a spreadsheet of inputs or operations. 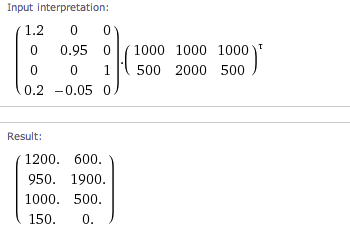 Notice the matrices touch at the “size of operation” and “size of input” (n = p). They should match! If our inputs have 3 components, our operations should expect 3 items. In fact, we can only multiply matrices when n = p.
The output matrix has m operation rows for each input, and q inputs, giving a “m x q” matrix. The “Adder” is just a + b + c. The “Averager” is similar: (a + b + c)/3 = a/3 + b/3 + c/3. Whoa — it’s the “identity matrix”, which copies 3 inputs to 3 outputs, unchanged. How about this guy? He reorders the inputs: (x, y, z) becomes (x, z, y). He’s an input doubler. We could rewrite him to 2*I (the identity matrix) if we were so inclined. These are geometric interpretations of multiplication, and how to warp a vector space. Just remember that vectors are examples of data to modify. And a bonus output: let’s make a new portfolio listing the net profit/loss from the event. The key is understanding why we’re setting up the matrix like this, not blindly crunching numbers. Got it? Let’s introduce the scenario. The new Apple value is the original, increased by 20% (Google = 5% decrease, Microsoft = no change). Making sense? Three inputs enter, four outputs leave. The first three operations are a “modified copy” and the last brings the changes together. The final numbers: Alice has \$1200 in AAPL, \$950 in GOOG, \$1000 in MSFT, with a net profit of \$150. Bob has \$600 in AAPL, \$1900 in GOOG, and \$500 in MSFT, with a net profit of \$0. What’s happening? We’re doing math with our own spreadsheet. Linear algebra emerged in the 1800s yet spreadsheets were invented in the 1980s. I blame the gap on poor linear algebra education. We can avoid hand cramps by adding/subtracting rows in the matrix and output, vs. rewriting the full equations. As the matrix evolves into the identity matrix, the values of x, y and z are revealed on the output side. This process, called Gauss-Jordan elimination, saves time. However, linear algebra is mainly about matrix transformations, not solving large sets of equations (it’d be like using Excel for your shopping list). Words have technical categories to describe their use (nouns, verbs, adjectives). Matrices can be similarly subdivided. Descriptions like “upper-triangular”, “symmetric”, “diagonal” are the shape of the matrix, and influence their transformations. The determinant is the “size” of the output transformation. If the input was a unit vector (representing area or volume of 1), the determinant is the size of the transformed area or volume. A determinant of 0 means matrix is “destructive” and cannot be reversed (similar to multiplying by zero: information was lost). The eigenvector and eigenvalue represent the “axes” of the transformation. Consider spinning a globe: every location faces a new direction, except the poles. An “eigenvector” is an input that doesn’t change direction when it’s run through the matrix (it points “along the axis”). And although the direction doesn’t change, the size might. The eigenvalue is the amount the eigenvector is scaled up or down when going through the matrix. 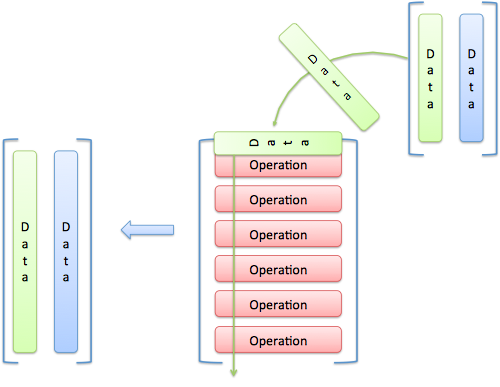 A funky thought: we can treat the operations matrix as inputs! Think of a recipe as a list of commands (Add 2 cups of sugar, 3 cups of flour…). What if we want the metric version? Take the instructions, treat them like text, and convert the units. The recipe is “input” to modify. When we’re done, we can follow the instructions again. An operations matrix is similar: commands to modify. 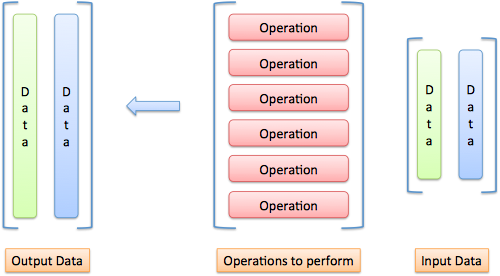 Applying one operations matrix to another gives a new operations matrix that applies both transformations, in order. means “Create matrix X, which first adjusts for news, and then adjusts for taxes”. Whoa! We didn’t need an input portfolio, we applied one matrix directly to the other. The beauty of linear algebra is representing an entire spreadsheet calculation with a single letter. Want to apply the same transformation a few times? Use N2 or N3. Can We Use Regular Addition, Please? Yes, because you asked nicely. Our “mini arithmetic” seems limiting: multiplications, but no addition? Time to expand our brains. Imagine adding a dummy entry of 1 to our input: (x, y, z) becomes (x, y, z, 1). The result is (x + 1, y + 1, z + 1, 1). Ignoring the 4th dimension, every input got a +1. We keep the dummy entry, and can do more slides later. Mini-arithmetic isn’t so limited after all. I’ve overlooked some linear algebra subtleties, and I’m not too concerned. Why? They’re not, unless you want a tool used to attack nearly every real-world problem. Ask a businessman if they’d rather donate a kidney or be banned from Excel forever. That’s the impact of linear algebra we’ve overlooked: efficient notation to bring spreadsheets into our math equations.